A Hobo Meal is probably the easiest meal ever to make. 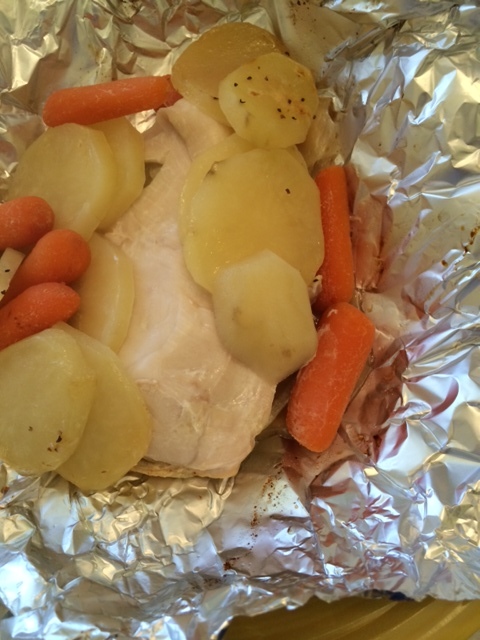 You have all your sides in with your entree in a tin foil pouch cooking at the same time. 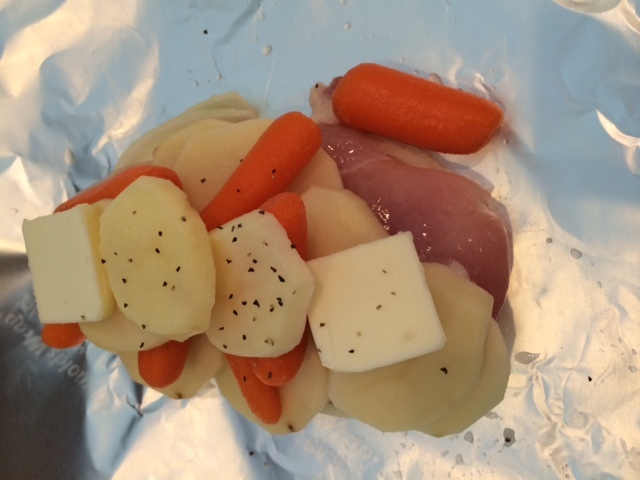 It consists of Chicken, Potatoes, and Carrots. It can be cooked in the oven or the grill. I recommend cooking it on the grill. 1. Cut up the onion and place on the bottom of the tin foil sheet. 2. Place the chicken breast on top of the cut up onion. 3. Cut up potatoes (1 potato per pack or as much as you desire) and put on top of chicken breast. 4. Place carrots on top of potatoes or around (they have a tendency to fall off). 5. Put some butter and sprinkle some pepper over everything. 6. Wrap foil up to make a pouch. Place on the grill for about 30-40 minutes, or until chicken is cooked thoroughly. This is an easy and quick meal. You can’t go wrong with chicken and potatoes! When I was younger I would never eat cooked carrots and now I love them! 1. Cook the quinoa: Once the pot of water is boiling, add the quinoa and cook 15 to 17 minutes or until tender. 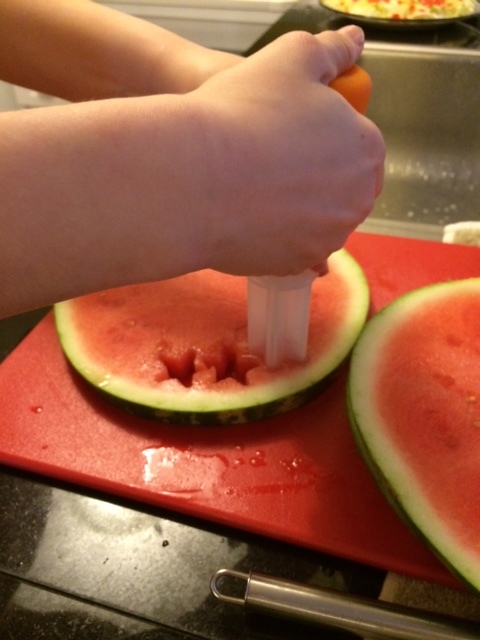 Remove from heat, drain thoroughly and set aside. 2. Cook the shrimp: While the quinoa is cooking, pat the shrimp dry and season with salt and pepper. In a large pan, heat 2 Tbs of oil on medium until hot. Add the seasoned shrimp and cook, stirring frequently 2 to 3 minutes or until cooked through. Transfer the cooked shrimp to a plate and wipe out the pan. 3. Cook the vegetables:In the same pan used to cook the shrimp, heat 2 tsps of oil on medium until hot. Add the carrot and peas and season with salt and pepper. Cook, stirring occasionally, 2 to 3 minutes, or until vegetable soften. Stir in the garlic, ginger, white parts of the scallions, and asparagus. Season with salt and pepper and cook, 1 to 2 minutes or until fragrant and the asparagus is slightly softened. 4. Add the shrimp, quinoa, and sauces to the pan of vegetables, add the cooked quinoa, cooked shrimp, and half of the green parts of the scallions and stir to combine. Continue stirring and add the mirin, soy sauce, sesame oil, half of the hoisin, and as much of the sambal oelek as you’d like, depending on how spicy you’d like the dish to be. Cook, stirring occassionally until moisture has evaporated and everything is crisped. Now, you all know I like quick and easy. This isn’t too bad on that scale. 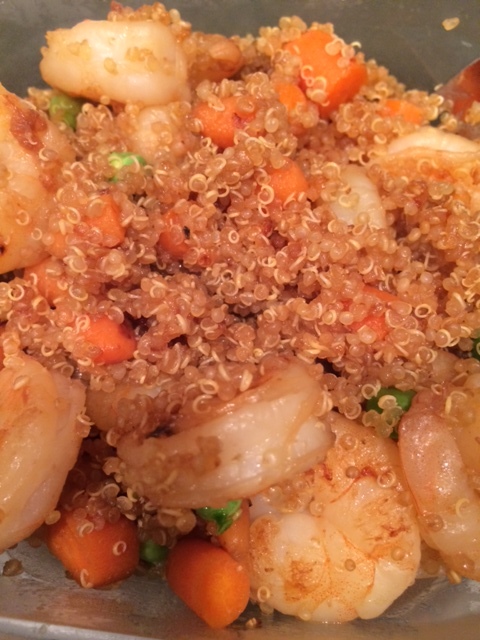 When I made mine, I only used the shrimp, peas, quinoa, soy sauce, and carrots. I know, I should have tried to follow the recipe, but I got impatient. I may have used too much soy sauce and I have now found out I do not like quinoa. If you do though, this recipe does sound and looks good. Try following it and let me know how you guys like it. I would love to hear your thoughts. First off, Happy Mother’s Day to all the mom’s out there! Most of us probably couldn’t make it through life without you, so thank you for all you do for us kids! Since it is Mother’s Day, I wanted to make a dessert that I knew mom would love. I have actually never eaten a cannoli, and have no idea what it is supposed to taste like so I didn’t want to trust a recipe I found on the internet. Instead, my cousin in New Jersey has given me a great Cannoli Dip recipe! Drain the Ricotta Cheese overnight in a cheese cloth (they sell them at Target or Bed Bath and Beyond). 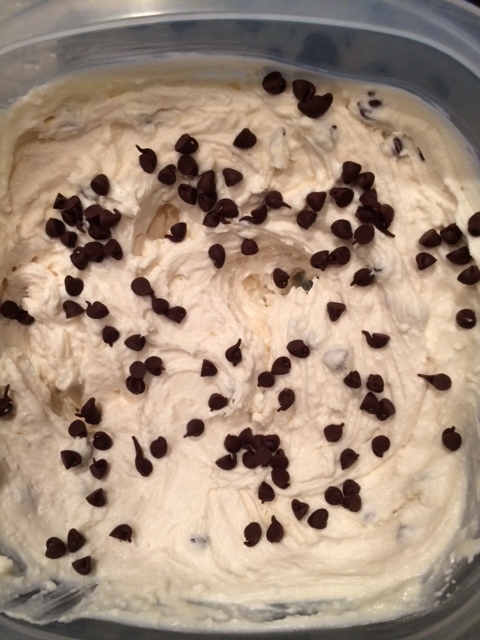 Mix Ricotta Cheese with the Cream Cheese, Sugar, Vanilla, and Chocolate Chips. Sprinkle some Chocolate Chips on top and chill until it’s time to eat. You can use broken up waffle cones to dip with. You can also buy a pie crust, cut small circles, sprinkle with cinnamon and coarse brown sugar and bake about 8 min. Very easy recipe, takes no time at all to make! Now, this being my first time trying it, I must say I can’t believe I have never eaten one before. This is so delicious! A little too much dairy for me, but who cares about that allergy anyways! Thumbs up all around from the family on this one! This weekend, I traveled to Michigan for a First Communion, so I took the weekend off of cooking. My cousins however, did not take a weekend off and put on a great Communion party. We had a lot of great food and desserts. I am still full from the party yesterday. Mix 16oz of Sour Cream with 1 packet of Taco Seasoning of your choice. After you mix it, put it on the bottom of the dish. 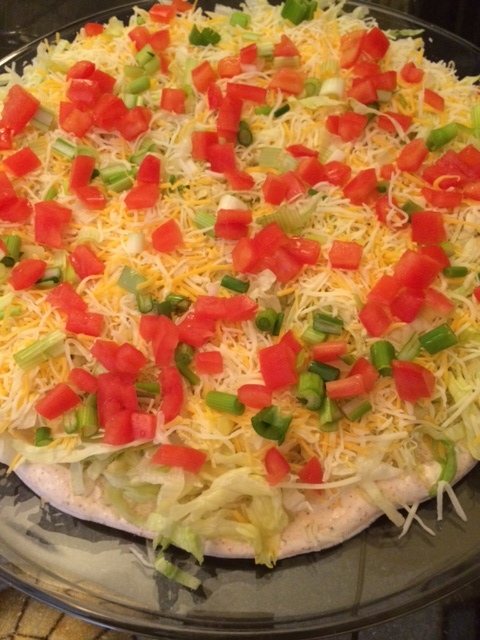 On top of the mixture layer cheese, shredded lettuce, tomatoes, and green onions. Very easy to make and very delicious! 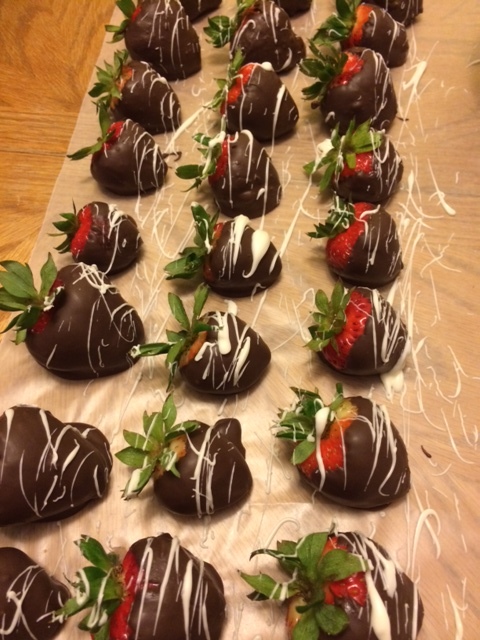 My younger cousin has become quite the professional in the kitchen and made some dipped strawberries for the occasion. I think we can all agree they look a lot better than my “carrot” dipped strawberries from Easter. She must have done this before! She dipped them in chocolate and then used a spoon to splatter the white chocolate onto them. Last, but not least, my cousins have their own Edible Arrangement Kit. You can all buy one at Bed, Bath, and Beyond. It really is very cool and looked very use to use! 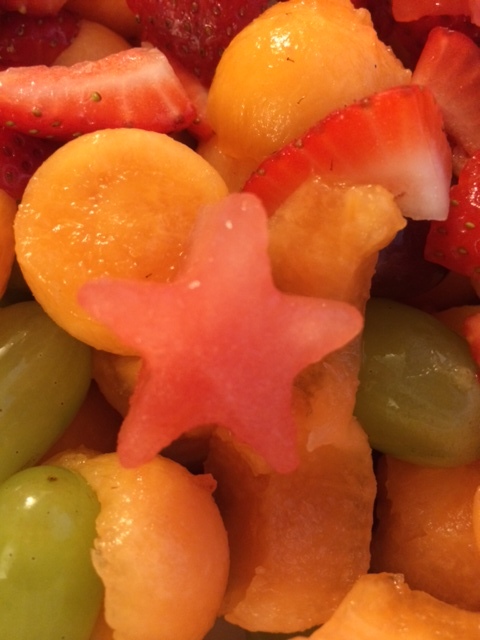 The kit comes with different shapes, but for the Communion, they chose stars. They came out great! Very good party all around, and thanks for letting me take a weekend off!